Hello ! My name is Diana Oprea, I am 18 and I was born in Romania. I love volunteering, travelling and hiking. So.. I’ve been in Mexico for about a week and this is the first time I’ve really had a chance to rest and jot down some of the observations I made during the 3 days spent in Ciudad de Mexico. 1. As soon as I stepped out of the hostel door I started receiving glances, sometimes full-on stares and got called “guerita”, multiple times. Guerita is an adjective attributed to people with white skin and is usually translated as “blondie”. Quite a shock to me seeing that my hair is the darkest brown you’d ever see but also very amusing. 2. I was introduced to the mexican subway, known as the “metro”. This method of transportation is very common among the 22 million people who inhabit Mexico City. (Yes, 22 million. That is close to the population of Romania). I got a real sense of this during peak hours when I found myself packed as a tiny sardine who could barely keep her balance when the subway was coming to a halt. 3. Still on the subject of the metro, I noticed that the waiting quay is split in two sections. One half is for men while the other is for women and children under the age of 12. This is done in order to prevent any type of harassment or aggression towards women. One poster in the subway stated that 1 in 3 women are being harassed in Mexico City, so the measure is quite well placed in my opinion. 4. Hospitality and manners stand at the core of the mexican education.The gold phrases: gracias, por favor, hola, adios, perdon, no te preocupe etc, which seem to be forgotten in our day to day adventures are greatly treasured here in Mexico. 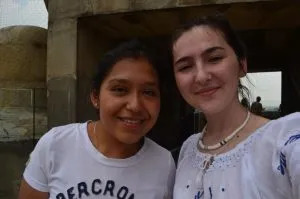 You will often get nasty glances if you don’t apologize when you bump into someone on the street and if you do apologize, this automatically brings you closer to gaining a new friend.Also, mexican people are very friendly towards foreign people and will always smile at you. 5. Trying to cross a street is dangerous. Traffic lights are a rare sight in Mexico and trying to cross the street can be quite an adventure. Also, a shock to the system were the buses in Mexico city, as they were functioning with their doors open and at full speed. 6. Street vendors and their slam poetry. While pacing the streets of Mexico city I have encountered people who were trying to hand me flyers for eye check-ups. These were positioned (strategically, I think), at every 2m and one might think that they were competing in some sort of slam poetry if you were to listen to their carefully learned-off phrases or that every mexican had some sort of eye problem and needed a check up. Quite an amusing sight nevertheless. 7. Police seems to be everywhere. At every hour of the day you can hear a police siren. Also, every second street had a line of officers fully armed and leaning against the wall of a shop for the entire day. I am still trying to figure out if this made me feel safer or more insecure. 8. The women’s dressing code. However hot it got during the daytime, all women would wear jeans and long sleeved shirts. This was done in order to prevent catcalling, just like the split subway quay. 9. Architecture, art and music. 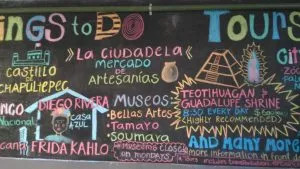 These are only a few of the beautiful elements which made me love Mexico city. Every corner, street, building has its own bit of history which awaits to be told. Large scale murals can be seen at every step and their messages are very striking. 10. If someone says “no pica” don’t trust them. Mexican food always contains some sort of spicy ingredients, be it deserts or even drinks. I got to learn this quite fast after putting two spoonfuls of chili sauce on my tortilla and saying “adios” to my taste buds for 2 days. These are only a few of the things which struck me during my first few days in Mexico City and which stayed in my mind ever since I left the beautiful city. Everyday is like a new adventure, full of challenges and lessons, especially now that I find myself in the dazzling city of Oaxaca.